2001 Stanislav Fiala’s MUZO building in Prague is a finalist for the Mies van der Rohe Award. Villa Tugendhat in Brno is added to the UNESCO World Heritage List. 2002 Villa Müller by Adolf Loos is reconstructed and opened to the public as a museum. 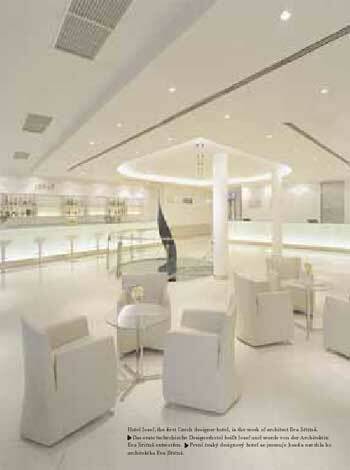 Hotel Josef, designed by Eva Jiřičná, is opened in Prague. There are floods in the Czech Republic. 2003 Pavel Nedvěd wins the Golden Ball award for the best footballer in Europe. A retrospective exhibition of Ladislav Sutnar’s work is held at Prague Castle. 2004 The Czech Republic joins the European Union. A young Czech designer, Dominika Applová, works with two German designers on Siemens Xelibri mobile phones. Jiří Šebrle wins a gold in the decathlon at the Olympics in Athens. 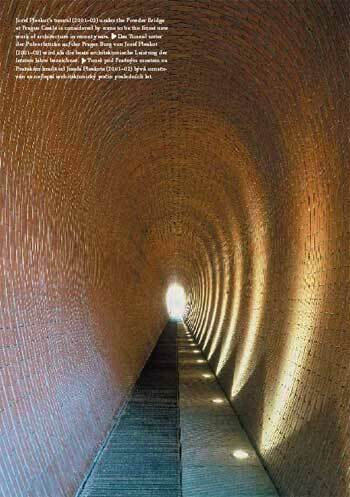 Josef Pleskot’s tunnel at Prague Castle wins the prestigious Brick Award. Ivan Zachariáš’s film ‘Mulit’ for Absolut Vodka, a parody of Bollywood, becomes part of the permanent collection at MoMA in New York. On Christmas Day Czechs send a record 52.5 million SMS text messages. Jan Čapek and Kryštof Nosál finish in second place in a worldwide competition held by Electrolux for a design for its Washman washing machine, aimed at men. 2005 In Prague the Cubist Grand Café Orient, faithfully reconstructed in line with period photographs, is opened at the House at the Black Madonna. The Museum of Decorative Arts has an exhibition on glass artist František Vízner.